Happy Wednesday – you have made it to midweek – the weekend is almost here. I’m glad to be back at My Color-Coded Life after a minor and successful surgery. I’m back on the mend and feeling good. The back -to – school time is in full swing as kids are entering their third and fourth weeks back. Fall is the universal “get organized, get systems in place” time of year. That’s very true in my household right now! Do you ever have a situation where you have a big organization project to do and you just don’t have time to tackle it all? So it will sit there – all piled up, in an awful mess? Today’s Helpful Hump-day Hint is a half-step solution to this problem! 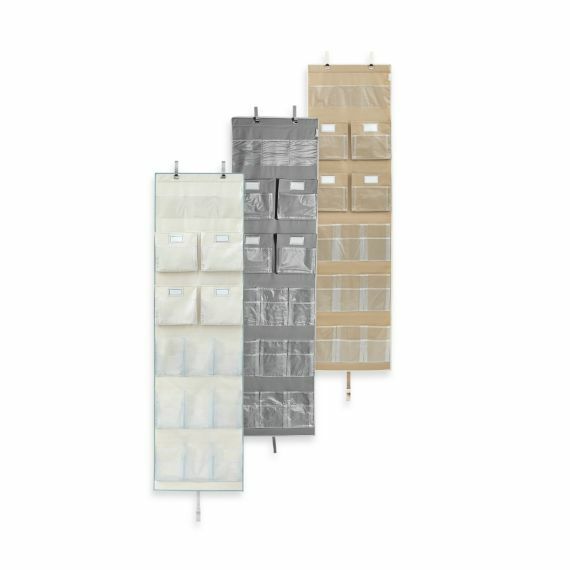 HHH#1 – Use over the door shoe organizer to hold objects that are not shoes and begin to organize a space. I have not had time to fully unpack and set up my crafting area in my new house. And it has been driving me crazy! I would say – I can’t set that up yet because… enter a million excuses here … I want a different craft table, I want to redo the dresser that is going to house all my craft supplies, we need to paint the room (after removing the wallpaper)…the list of excuses could go on and on. 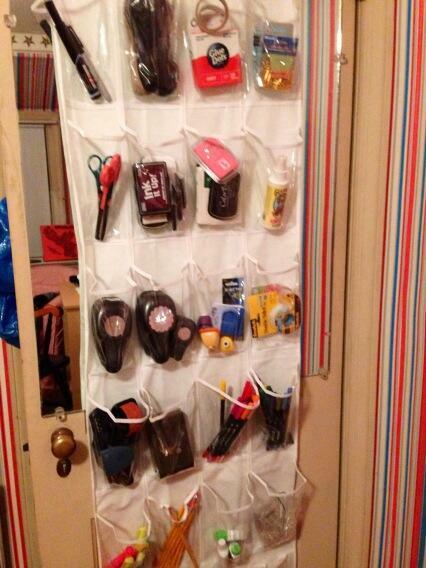 So as a “quick fix,” I got an over-the-door shoe organizer and put in as many craft supplies as I could. This unpacked several boxes, cleared drawer space for paper supplies, and cleared two surfaces so now I can actually do some work! These is an inexpensive one from WalMart. I bought two more for the two hall closets too. I splurged and bought a more expensive one from Bed Bath and Beyond – the Real Simple Multi-pocket organizer for my basement door. Larger pockets and comes with labels. Woo- hoo! I love labels! How are you getting organized as you get back into your routines? 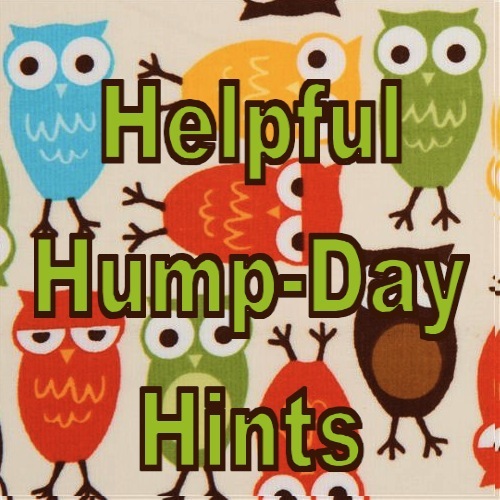 Leave me a comment with a Helpful Hump-day Hint! We are almost to the 500th comment on my blog and you know what that means!! A prize! But you can’t win unless you comment! Minor surgery?? I hope you are ok! This is Lainie’s first year of school outside of the house. We had a classroom for her in Philly (her nursery converted into one) and here in Florida we had turned her walk in closet into a classroom, yes it is that big 🙂 Now that she is in school all day with Joe I was able to finally organize my own work space! I now have my office in her closet. That’s sounds silly. But I have a lot more space here than when I was working at a corner of the dining room table. I organized all the drawers in here so that we have a craft drawer for Lainie’s art projects, a supply drawer with extra folders, notebooks, pencils for Lainie and a drawer for me with all my work paraphernalia. As I organized, I wrote down everything I was putting in the drawer on an index card which I taped to the inside of the clear drawer. No rummaging around and making a mess. You can look at the index card and see if what you need is there. If I didn’t write it down, don’t even open the drawer 🙂 I still have a lot to figure out, minimizing clutter for a small space, but it already feels like it is mine! I love the idea of the over the door shoe hanger for storage. I had one that I was going to use for Barbies/dolls but the dolls were too tall. I am going to keep it in mind if I start to notice I need more than a drawer.